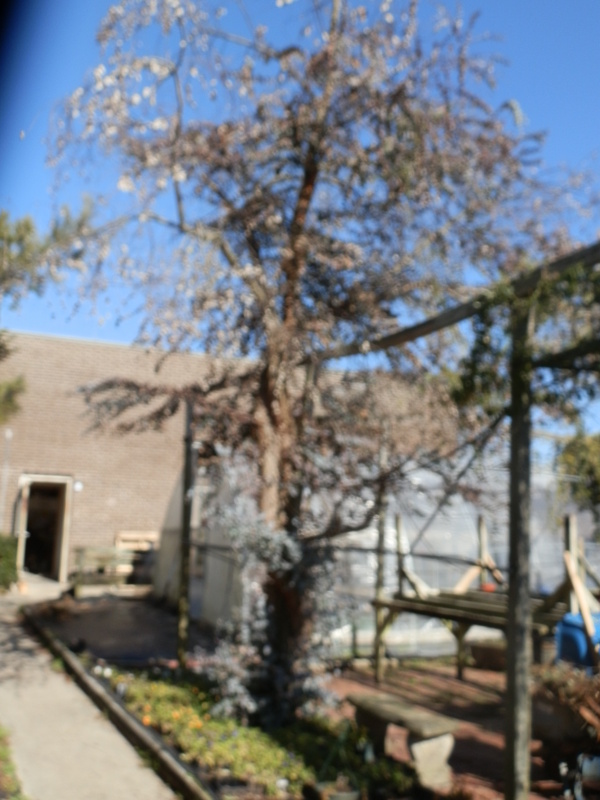 I recently pruned my eucalyptus tree (Eucalyptus polyanthemos) at school. It has grown into a gorgeous specimen in the last ten years or so. Several times I’ve been tempted to buy a stuffed koala to stick in its branches and see if anyone notices. We get regular requests for clippings by gardening enthusiasts who want to try their hands at propagating this Australian beauty. The problem is that eucalyptus won’t propagate by cuttings at any time of year or stage of growth even using rooting hormones. Mine hasn’t started producing seed yet, but even when it does it’s not like planting garden seeds. Germination time of my silver dollar eucalyptus species is over 80 days. That’s plenty of time to make a mistake and lose the seedlings. Weeds will creep in too. Eucalyptus grow well in full to partial sun and are quite drought tolerant. Take care to choose a protected spot as they are marginally hardy here. Recognizing microclimate will pay dividends. This past winter though it took a heavy hit. Temperatures hovered in the low teens and it has struggled this year but it’s now on the mend. In its juvenile stage, nearly round leaves emerge from the stem in groups of two and look like silver dollars. Blades connect to the stem directly, much like a zinnia, with no stem-like petiole. Color is a brilliant greenish blue. My tree is a little over 20 feet tall and growing fast. Eventually the leaves begin to change. Some develop short petioles and blades become more elongated and pointed. This is the adult foliage and the metamorphosis is not unique to eucalyptus. Many junipers change texture as plants mature. Our specimen treats us to the strong aroma of menthol, but it hasn’t quite made it past the juvenile stage yet. I keep looking for small flowers in clusters of three and some changing foliage, but I’ve yet to find any. More than 500 species of eucalyptus thrive throughout Australia and much of the South Pacific. They are among the tallest trees in the world. Most people are familiar with eucalyptus as it is a common component of flower arrangements and a familiar addition to cough drops. Some people use the foliage as simmering potpourri to freshen stale air. in one dose could kill you. Eucalyptus leaves contain chemicals that might help control blood sugar. They also contain cineole, which helps kill fungi and bacteria. Their ability to clear nasal passages has made eucalyptus leaves a staple for respiratory maladies. 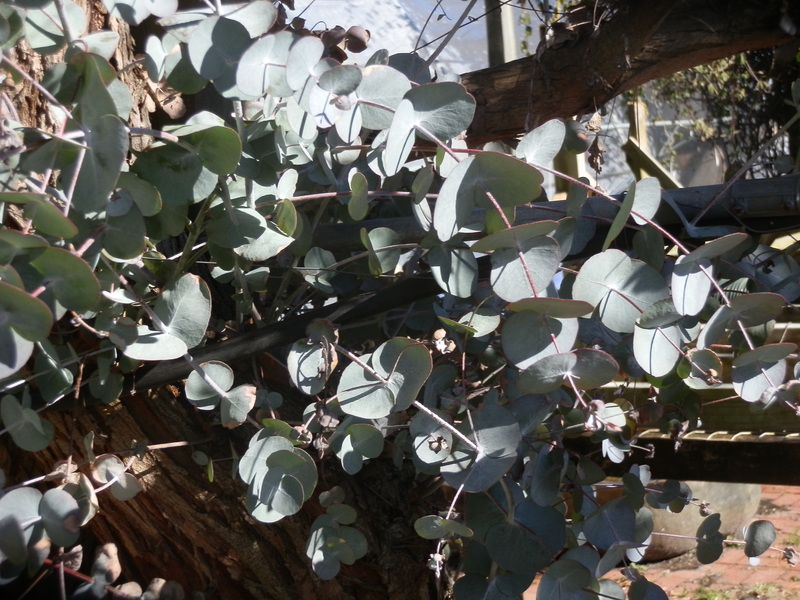 Eucalyptus has even been used to treat genital herpes, bleeding gums and ulcers. There appear to be many interactions to prescribed medications. Most deal with the liver’s ability to break down foreign chemicals in the body. Checking with your doctor or pharmacist would be crucial before ingesting significant quantities of eucalyptus, particularly extracts. This entry was posted in foraging and tagged control blood sugar, Eucalyptus, flower arrangements, foraging, full to partial sun, marginally hardy, microclimate, silver dollar eucalyptus, simmering potpourri. Bookmark the permalink.